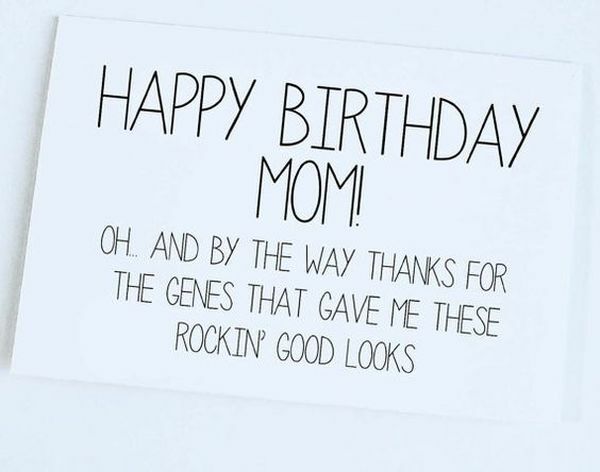 Your mother will be touched to receive a card with one of the following sincere birthday quotes from daughter. Do you agree that a daughter is a small and young version of a mother? You can be sure that your mom dreams of seeing you a successful and happy woman. 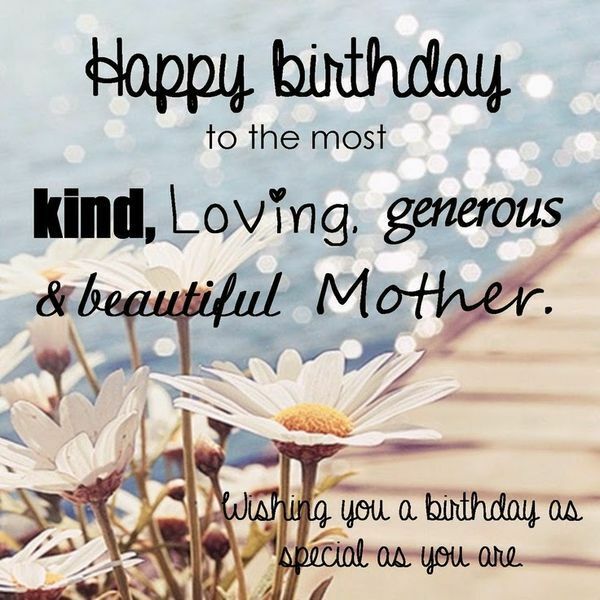 If you send your mom a birthday quote, this will bring her so much joy and happiness. Needless to say that your mother needs to feel your love, so do not be shy to prove it to her. Mothers have very strong attachment to their children and they will be extremely happy to receive even a small gift from their lovely girl. Birthdays are a great chance for you as a daughter to open your heart and tell your mother what you feel and how strong you love to her is. And it’s in your hands to make a mother feel the most special person in the entire world. Appreciate every minute you spend with your mom and always be a daughter who cares about her mother and the rest of the family. The link between a mother and a daughter is super strong, even if they are far from each other. Usually, daughters gain the most important knowledge about this life from their moms. The way your mother lives will be your best sample, but you will do it your own way, of course. So, as we were saying, let your mom feel your love. There is no need to hide your emotions. Well, now the question is, “How to pass your sincere congratulations to your mother on her birthday?” The following quotes will help you find matching words to express your deepest love to on of the most important women in your life. Read the following birthday quotes and pick up some interesting ideas. Be sure that your mom shares exactly the same feelings of love. Let’s say, your mom’s birthday is tomorrow? Make sure you have prepared everything that is needed to make this day unforgettable. A birthday gift? Checked. A delicious birthday cake for your lovely momma? Checked. How about a birthday speech? We are sure that the birthday quotes, presented below, will help you to come up with the best possible congratulation. My sweet mom, you are the most important person in the world for me. Remember this even when I am in anger. Happy Birthday, my lovely mother! My mother is the most caring and beautiful woman in the world. I wish to be like her. You gave me this life, all your sweet love and wise knowledge. I love you with all my heart and miss you so much every day. Can’t wait till we meet and hug each other very strongly. Happy Birthday, my mommy! Mama, I am always here for you. I want to make your birthday very special, just as you do every day of my life. Mommy, my love, happy birthday! Happy Birthday, the sweetest mommy in the entire world! I love you. Today is your birthday and you are granted the title of the best mom of the year. You are awesome and I wish you all the best due to your birthday! 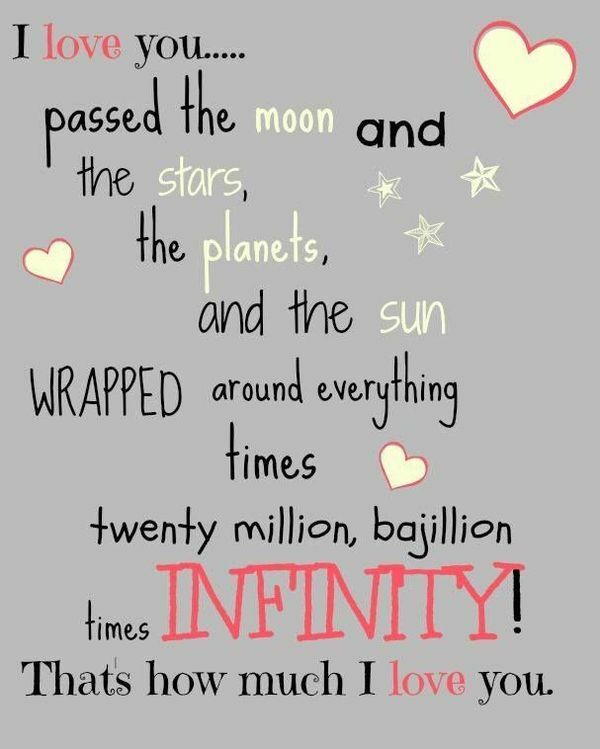 Mom, I want you to know how much I love you. You gave me life and I will transmit this gift to my own children. You are my sample of a perfect mother. Happy Birthday! God blessed me with the mother like you. You are a unique woman. I admire your love and care when it comes to our family matter. Mommy, my love is so strong you can’t even imagine. Have a wonderful birthday! Mom, you are the only person you always believe in me and encourage to grow. We love each other and this is the biggest gift you could give me – this life! Happy Birthday! Mommy, your birthday has to be as awesome as you are. Happy Birthday! I love you! The best thing about moms who have a good sense of humor is that daughters can play big and choose funny Bday wishes instead of ordinary ones. Without a doubt, a birthday isn’t supposed to be some kind of formal dinner organised by the Queen of England. On the contrary, it’s supposed to be funny in a first place. And since it’s your duty as a daughter to throw the best birthday party for you mommy, take a look at the following funny birthday wishes. Do you know what famous person was born on this very special day… I don’t know either. I only know of you. Happy birthday mommy! Congratulations on being the luckiest mother on earth for having such a good-looking, smart and incredible daughter. For your birthday I wanted to get you a special birthday trip to the only place I know you would really want to go. Unfortunately, they sold out of tickets for the time machine. I guess you’ll have to enjoy your presents in the present. Happy Bday mom! Dear Mom, it’s your big day. As a gift, I’m going to let you bake me my favorite cookies…because it makes you happy! Do you agree that poems are the classic when it comes to congratulating a person with a birthday? Well, we do. That’s why we couldn’t pass by the most beautiful birthday poems for mothers. There’s one thing left, though. You need to buy a cute birthday card, take a pen and copy a poem which you liked most. Yeah, easy as that. a Mom that I Adore. 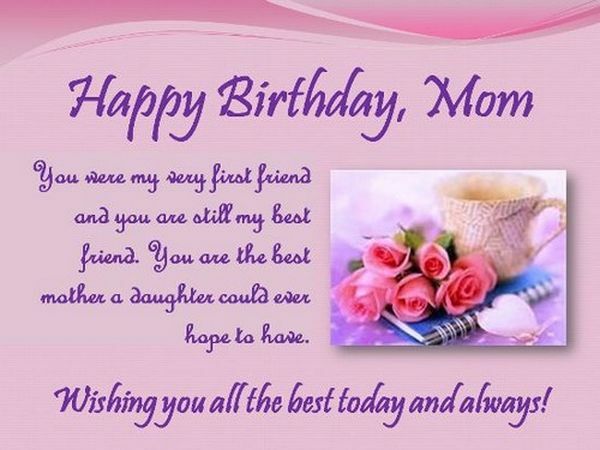 I wish you a very Happy Birthday Mom! Happy Birthday Mom! Every bday memory I have includes you lighting the candles on my cake. I hope that for your birthday every hope, wish, and dream you have comes true today. If anyone deserves such happiness, it would be you, my loving mom. Ma, I want to grow up to be like you in the future. Sending you lots of love from your daughter. Happy Birthday Mom! Mom, you are the most outstanding woman in my life, and you shall forever be my number one. Have a beautiful birthday. You know what makes a perfect birthday greeting? There are three main rules: you have to be sincere, have a good sense of humor and make it personal. 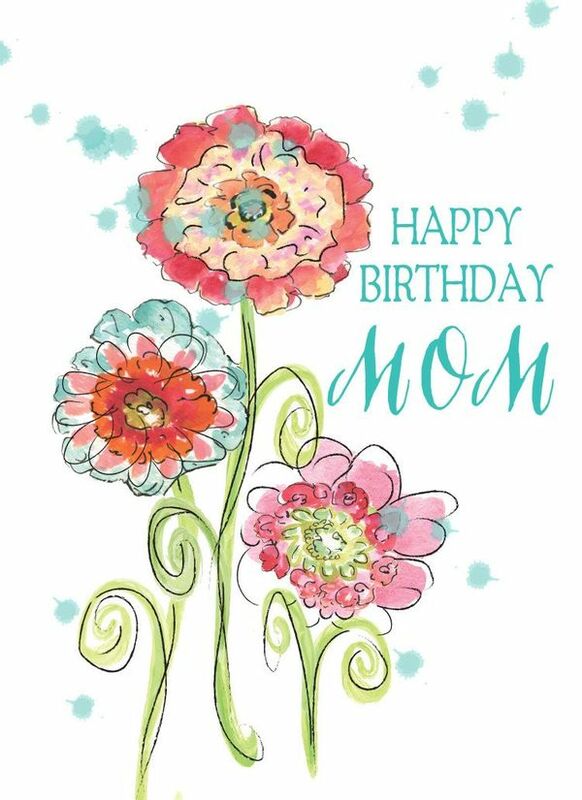 All of these features may be found in the next birthday messages for mom. And as a bonus, these messages are super cute. Throughout the life of a person, that person will be challenged by many different fights and struggles. Life is a fight. You can always choose to fight to win, fight to lose, or fight to learn. Thank you for showing me the difference. Happy birthday, mom. You may have become my mom through marriage, but you became my bestie through love. Thank you for always trying so hard to love me even though I was so resistant at first. I am so glad you persevered! Wishing a happy birthday to the most important and treasured woman in my life, who happens to be my sweet mother. Love you so much, Mom. May happiness forever flow freely through your life. Mom just remember… The older you get, the better you get…. Unless you are a banana! Happy Birthday Wishes Mom! Even throughout all our petty fights and disagreements, our love has held up. Thank you for caring for me deeply and loving me so strongly. May you have a lovely birthday this year. If you feel like there are no such words that could describe the way you feel about your mom, it’s ok. Colorful birthday cards can say a lot more than you think. And we have some great examples here.